Japan’s reputation as a nation of uptight, overworked weirdos has been overstated internationally, but make no mistake, the Japanese language is indeed a polite one. Any second-year student of Japanese can tell you at least three ways to say “I’m sorry” with varying degrees of formality, and a quick way to get yourself labeled an idiot foreigner is to use excessively informal language when speaking to a superior. It’s also a language that’s poetic in its grammatical simplicity, two things that might help explain why interpreters are struggling to translate Donald Trump’s bigoted comments and stream-of-consciousness ramblings into Japanese at all. 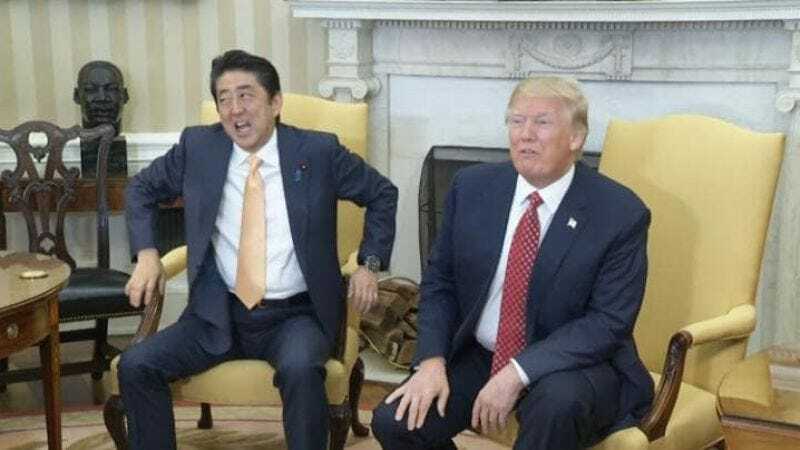 “He is so overconfident and yet so logically unconvincing that my interpreter friends and I often joke that if we translated his words as they are, we would end up making ourselves sound stupid,” professional interpreter and translation professor Chikako Tsuruta tells The Japan Times. Trump’s presidency has stirred presumably exceedingly civil debate amongst the country’s interpreters, who are divided over whether to polish Trump’s phrasing in translation or interpret it exactly as it falls out of his little orange mouth. The problem isn’t the difficulty of the words themselves—a study conducted last year by Carnegie Mellon University’s Language Technologies Institute put Trump’s vocabulary at a seventh-grade level—but rather the fact that when they’re not offensive, they make no goddamn sense, and translating that while maintaining your professional dignity can be difficult. But as retired interpreter-turned-university professor Kumiko Torikai puts it, although she would personally struggle with repeating Trump’s misogynistic and xenophobic comments, “As an interpreter, your job is to translate the words of a speaker exactly as they are, no matter how heinous and what an outrageous liar you find the speaker to be.” She adds, “If Trump is not making sense, you don’t get to make sense, either.” Explaining what the hell is going on with his handshakes can’t be an easy task, either.